When it comes to designing, size is everything. Just a smidgen in bead size inconsistency adds up, creating buckling and even outright failure for a design because those little smidgens really do add up. So how does one deal with this? First, when it comes to bead size inconsistencies, know that you are not crazy. More on this in just a minute. Second, practice swatching. When I first started knitting years ago, all of the patterns and books that I read, as well as fellow knitters, insisted that I swatch first before starting a project. Because every knitter knits at a different tension, by knitting up a 6- to 8-inch square and counting the stitches and rows, knitters are better able to get a more accurate stitch count and to also test out the yarn itself. I think that this is a practice beaders need take up as well, if you are not doing so already, not so much for sizing but to make sure that the beads you select for a project play well together. I have found it very handy. So what would bead swatching entail? 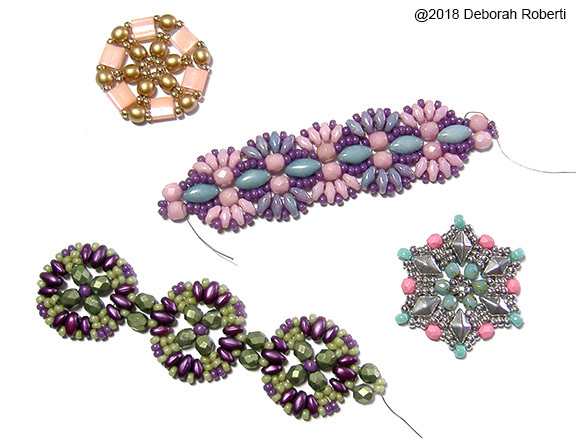 Basically, instead of selecting all of your beads and starting to bead an entire project, bead the first two or three motifs or an inch or so of your piece to get an idea of how the beads are coming together and whether the colors are working. If it doesn’t work, just take it apart. Sometimes a fatter seed bead or a fire-polished bead with a different coating will work better. Now about those smidgens. 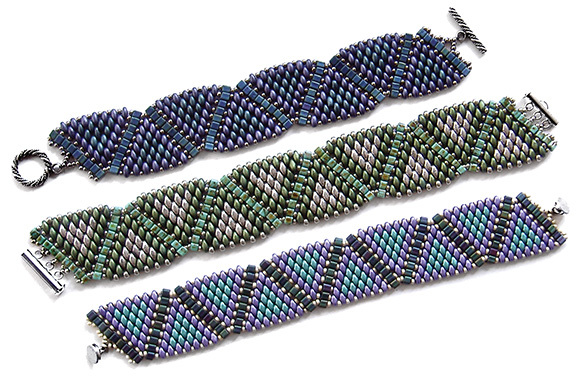 Let’s use rocaille seed beads as an example and Japanese seed beads in particular. When it comes to rocaille seed beads, I am a Miyuki lover. In fact, I personally think their Duracoat line is just about as close to perfection as you can get. But oh, the Toho colors and coatings! They take your breath away. Even the product names leave you giddy: Metallic Airy Blue, Silver-lined Dragonfruit, Raku Cabernet Iris, Higher-Metallic Dragonfly. The problem, however, is that many of the Toho 11/0 rocaille seed beads are just a smidgen fatter than the Miyuki brand—just enough to create hell and havoc on a design. This is why I often specify that Miyuki rocaille seed beads work better than Toho seed beads in certain projects and why you should always…. SWATCH! Bead coatings can also cause size discrepancies and with all of the new coatings and manufacturers in the bead world, this is getting even more crazy, especially when it comes to fire-polished beads. I have found that 3mm and 4mm Preciosa fire-polished beads can be noticeably smaller than some of the fire-polished beads produced by other Czech bead manufacturers but even within these same manufacturers, bead size will vary a smidgen depending on the coating applied. And crystal… if you sometimes get the feeling that 4mm Swarovski bicones and pearls are just a smidgen smaller than their Czech counterparts, you are not alone. Lately, I have been rebeading a lot of my old designs and upgrading the pattern instructions. New Czech beads are hitting the bead market every day, or so it seems. Some of these new beads just work better than the beads I originally used way back when and for other patterns, it’s just fun to swap out older beads with new beads to give an old pattern a facelift. Czech Preciosa Twin beads came out in 2012, shortly before the now-infamous SuperDuo beads, and I gobbled them up as fast as my friend Betsy at RedPandaBeads.com could send them to me for designing. Although Preciosa is now creating “pressed” Twin beads (made in a mold like SuperDuo beads), when Twin beads were first manufactured, they were not “pressed” and as such, very irregular in size and definitely more oval shaped. Because of their fabulous coatings, consistent size and lovely tapered ends, Czech SuperDuo beads hit the bead scene fast and hard and are now the most popular Czech two-hole beads in the world. But are Twin beads and SuperDuo beads interchangeable? Well, sometimes yes, sometimes no. Sometimes yes with some tweaks as is the case for my recently updated Twin Cube Wave Band where you can see the difference between the beads—Twin beads (top), SuperDuo beads (middle) and MiniDuo beads (bottom). The design change is not at all huge, but in order to keep the SuperDuo version from bulging or leaving air between beads in the last row, you have to add size 8/0 seed beads instead of size 11/0 seed beads along the outer edge.